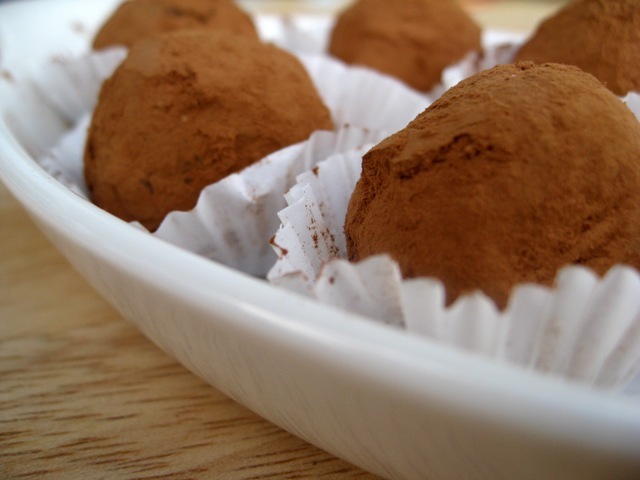 Chocolate goat cheese truffles - photo by Angelina Williamson. Briar Rose Creamery got its first award this weekend! We entered cheese and truffles into the cheese competition of the American Dairy Goat Association annual meeting. The meeting was held in Tuscon, Arizona this year. Since we couldn't attend, we Fed-Ex'ed a couple of boxes full of samples and ice packs to a hotel near the airport in Tuscon. We simply wanted to get feedback and see how our stuff holds up to critique. The results came back and we got a 2nd Place ribbon for our Chocolate Goat Cheese Truffles! I'm still jumping up and down with excitement. I can't wait to see the notes from the judges and see what they thought of our fresh chevre. 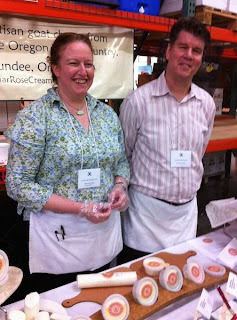 Tami Parr was one of the judges and posted the list of winners from Oregon on her website: Pacific Northwest Cheese Project. If you want to buy some truffles, you're in luck. They're available only at The Cheese Bar in Portland, Oregon, or Sundance Natural Foods in Eugene, Oregon. We also had them at our farmer's market booth, but that's over for the season. Stay tuned to our Facebook Page. I'll post more locations as we get them. We're pretty picky about who sells our truffles. This first year of production has been full of trial and tribulations for Jim and me. Not a week goes by that I don't question my sanity. Why am I doing this? How am I going to pay for all of this? Will my building ever get finished? Will I survive this start-up phase? How am I going to get everything done that needs to be done? Receiving an award for my truffles validates my work and reasons for making cheese. People like us! I make tasty truffles! I've never seen myself as an entrepreneur. I've always worked for others, and try to do the best that I can in any given situation. Starting my own business is completely out of my comfort zone. I'm getting a knot in my stomach right now as I write about it. I took classes offered by the Small Business Administration in San Francisco but I still feel totally out of my element and not as well prepared as I should have been. I'd like to find a mentor who knows all about starting and running a small food production business. That might ease my anxieties. I really am better at handling my anxieties these days. I try to take a few minutes each day to clear my head. I even meditate. My spiritual practices support me, too. I try to see the bumps in the road as learning tools. Each lesson is making me a stronger person and a better business woman. We're following our hearts and going for our dreams. This is a great thing! We made it through our first Farmer's Market season. I still can't believe they end so early, around here. But that seems to be a good thing because the rains came this weekend and things are very wet and soggy, not good outdoor shopping weather. Photo: Sarah and Jim at Provvista's Open House. We knew this first year would be about building a customer base and getting our name out there. At each market folks would flock to our tent and try our cheese. Many would take one home with them. It was fun to see which cheese would sell the best at a market. There were seasonal winners, too. Lemon Dill Chevre is a summer cheese. When the weather was nice, it would outsell everything else. When the thermometer dips below 65 degrees, Garlic Herb Chevre was a clear favorite. When the leaves started to turn color and the crisp air of Autumn set the tone, Rosemary Peppercorn emerged as the crowd-pleaser. We're also getting on the menu at a bunch of local restaurants. The local chefs are really happy with our cheese and are putting it into some fantastic dishes. I still get a huge thrill to see Briar Rose Creamery called out on a menu. Jim likes dropping by restaurants and meeting with chefs. He'll give them a pound of chevre to play with and checks up on them the following week. Most chefs have been glad to get good cheese for free. Who wouldn't? We then encourage them to place orders from our distributor, Provvista or buy directly from us if they're nearby. If you want to be inspired and see how local chefs use our chevre, we're on the menu regularly at some of our favorite local restaurants like Subterra in Newberg. In Dundee, you can't go wrong at any of the local eateries: Dundee Bistro, Tina's Restaurant, Farm to Fork, Red Hills Provincial Dining, in McMinnville, stop by Nick's Italian Cafe or Nick's Backroom, La Rambla, or Crescent Cafe. In Portland, I'd love it if you would swing by Ned Ludd or the Cheese Bar, as they both use our cheese. The Cheese Bar also is one of the few outlets for our AWARD WINNING Chocolate Goat Cheese Truffles! Going skiing? You just might find our cheese on the menu at Timberline Lodge on Mt. Hood.